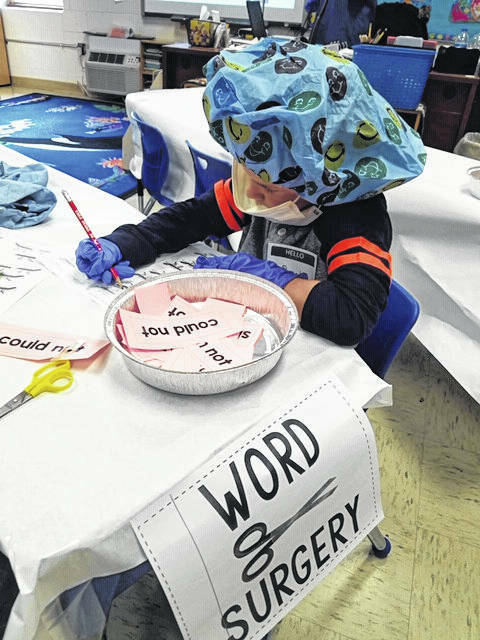 Courtney Sayre’s first grade class is pictured dressed in surgical gear while performing “surgery” on their contraction words, cutting them apart and bandaging them with apostrophes. 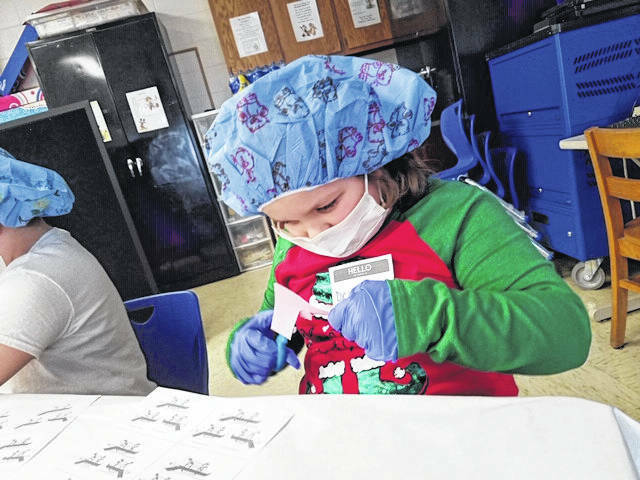 It is uncommon to hear of surgery taking place in an elementary school, however, “contraction surgery” took place at Point Pleasant Primary School (PPPS) in Courtney Sayre’s first grade classroom. Judy Browning, title I teacher at PPPS, and Sayre planned and participated in a classroom transformation for their students. Operating tables and surgical trays were prepared for the children when they entered the classroom that morning. 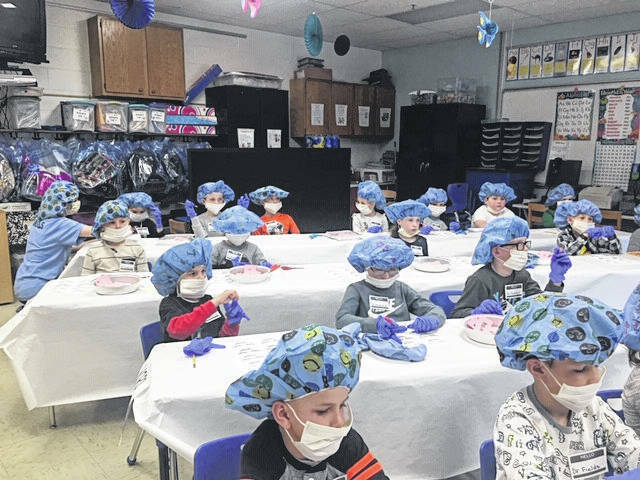 Colbe Ingels, FNP-BC, and Pleasant Valley Hospital (PVH), provided Sayre’s first grade class with surgical gear to wear while performing “surgery” on their contraction words, cutting them apart and bandaging them with apostrophes. The classroom transformation provided students with an engaging means of learning outside the box. According to Principal Vicki Workman, classroom transformations alter a classroom environment in order to increase student engagement and enrich student learning with rigorous content. 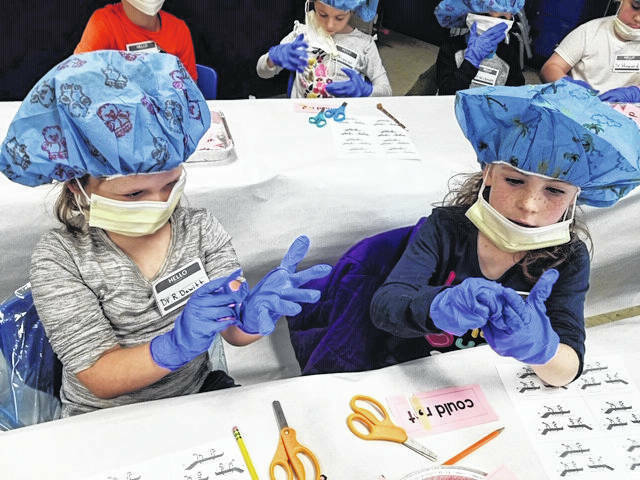 She shared she is certain future lessons with classroom transformations will occur due to the “great success” of the contraction surgery event and with the help of members and businesses in the community contributing resources and support, such as with PVH.